As a leader, you face challenges of all levels of magnitude every day. The Challenge-Development Curve is a useful model we use at Bates to help capture the opportunities and risks for leaders when they reach key “inflection points” in their careers. We interviewed our Vice President of Executive Development, Bill Macaux, asking him to reflect on leadership challenges and how they show up within organizations. Q: Bill, what is the Challenge-Development Curve? A: It represents an important part of our learning theory about executive development. Typically, executives as individuals, or in groups, are presented with challenges of various kinds. Part of a leader’s natural course of development happens as they encounter and deal with challenge. In the face of challenges, leaders are forced to focus their attention and to increase and intensify their effort and problem solving. The course of this adaptive development carries the leader up a curve of learning. They acquire greater competency to handle novel and challenging situations…up to a point. That point is what we call an inflection point. It’s the point at which we begin to become a bit overwhelmed. We find that our current resources and capabilities aren’t quite up to the level of challenge that we’re facing at that moment. So, at that point if we sustain our efforts we’re likely to experience frustration, exhaustion, and typically a decline in our effectiveness and competence. Absent some kind of an intervention, we’re going to go down the other slope of the curve, which we refer to as decompensation. Decompensation is quite literally losing the capacity for adaptive response to challenge. On the other hand, if, at the inflection point, we become aware that we’re reaching that level of challenge, it may be timely to seek some support that would enable us to lift our capabilities beyond what they currently are. That would take us to another curve. That usually involves gaining some increased self-awareness of what we’re experiencing and what we need, and then getting some support in the way of advice or skill building. 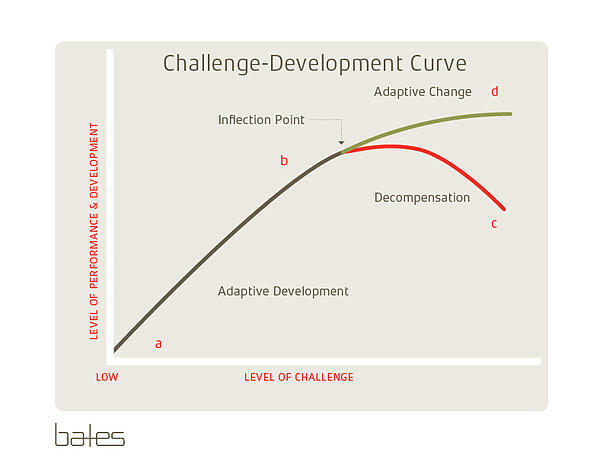 Q: Why is the Challenge-Development Curve important to leaders in their own development? A: As a part of executive self-management, individuals have to become increasingly attentive to how they’re doing: How stressed, strained, and frustrated they might be. There might be episodes of that, but when that occurs and sustains in more of a chronic and lasting way, it probably indicates that you need to change something. That is a good time to seek out someone to talk to, because typically we’re going to become clearer quicker if we can get into dialog about it. Q: How does the Challenge-Development Curve relate to developing executive presence and influence? A: Well, clearly if we’re moving up in a course of adaptive development (the positive side of the curve), we’re probably modeling some good behavior for others. We’re probably engaging others well and leveraging the capabilities of those to whom we’re providing leadership. So it’s an indication that our presence is probably productive and positive and that it’s asserting a constructive influence on those around us. Q: Why is it particularly important for leaders who are getting promoted to new positions and being put on a bigger stage? A: One of the dimensions of a promotion or getting put on a bigger stage is that you take on a broader scope of work. Perhaps work with greater complexity or novelty—all dimensions of challenge that are changing in your day-to-day tasks. 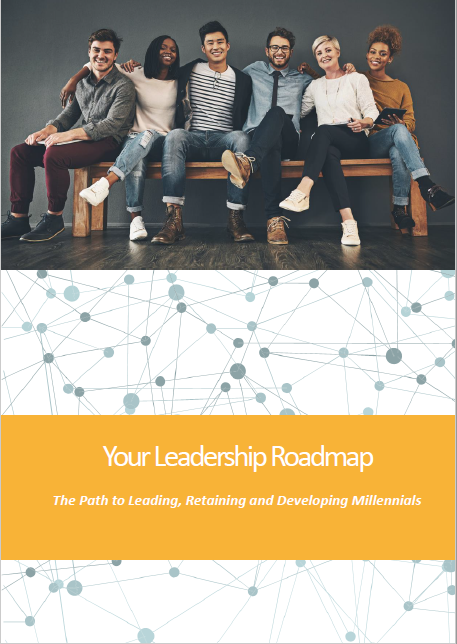 Predictably, one would assume that there might be some need to support that leader in that role in order to notice and intervene in a timely manner with any sort of scaffolding and support. That could be executive coaching, it could be some coursework, it could be a variety of different things. Q: What can an organization do to help leaders move towards adaptive change and not fall into the trap of decompensation? A: That’s really where effective coaching, managerial coaching, and development come in. If we’re working together closely and ably enough, we’re probably able to notice and call that out to someone’s attention. Sometimes simply by noticing and calling it out, it allows people to extract themselves from the heat of the emotions and figure things out. Sometime additional resources or help are required. Bill Macaux, Ph.D is VP of Executive Development for Bates. 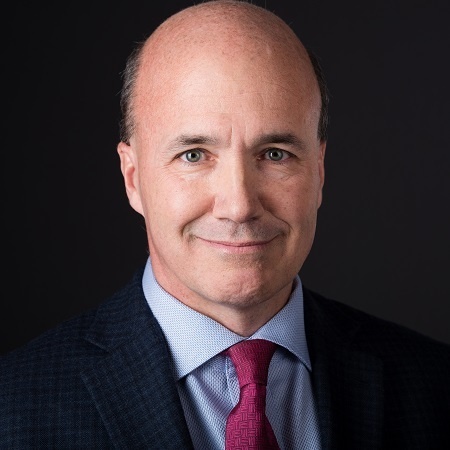 With decades of experience in executive development and assessment, Bill has led our efforts to create the Bates ExPI, the first and only research-based assessment of executive presence.